Adsense is every bloggers dream but the dream dies when there earning is very low, Bloggers tends to give up because of this. 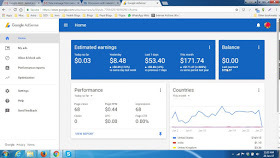 There are many websites out there that gives URL to block low CPC ads, So I'm not going to say the same thing again rather I will show you another way to increase AdSense earning. Well, before I proceed further, I would like to discuss some common terms like CPC, CTR, RPM with you. Because if you're not familiar with these terms, then you'll have a hard time making money out of your Adsense account. What is CPC in Google Adsense? CPC is the cost-per-click, and it is the amount of money you earn each time a user click on your ad. Now, CPC for your ad is determined on the Ad displayed on your blog. Some Advertisers may be willing to pay you more than other advertisers. I'll discuss that in coming points that will clear your confusion. CTR is the Click-Through-Rate, and it is the number of clicks received for each 100 impressions. Thus, if you've Adsense ads ACTIVE on your blog, and you receive 100 impressions and 5 clicks, then your Adsense CTR will be 5%. I've taken the best answer from Go﻿ogle support itself. First block ads that are not paying well in your AdSense dashboard -> Allow and Block -> General. Block the inactive ads . Then open keywordSpy and type the keywords you need their ads on your blog, thick keywords and search. When it opens you will see the amount the cpc keywords pay then click on ads, copy the URL and put it your AdSense allow and block, then allow the ads. That is how to get high cpc ads showing on your blog/site. Now here is how to block the low cpc ads but first we need to know the ads that are showing in our blog so we can know the one that is paying well or not. Open Google Sandbox, input your URL, click show Google ads. you will see the ads showing in your blog, copy the URL then goto keywordspy input the URL, search and click on ads, you will see their CPC rate, if its low then go to your AdSense allow and block input the URL and block it. The above steps shows how to increase your adsense cpc and earn Big with it. I also advise all bloggers to have anti adblocker code, plugin, script or snippet in their blogs due to high adblocker rate with this anti adblocker code running smoothly on your blog you will be amazed at how increasingly fast your adsense earning is growing. If you find this thread useful please kindly drop a comment and also share with friends. This is a very great tutorial you penned down here sir, i have been looking for this kind of article to read. I am very happy i came here.